The amount of time required to increase your maximum bench press to 100 lb. can vary considerably depending on your fitness level. 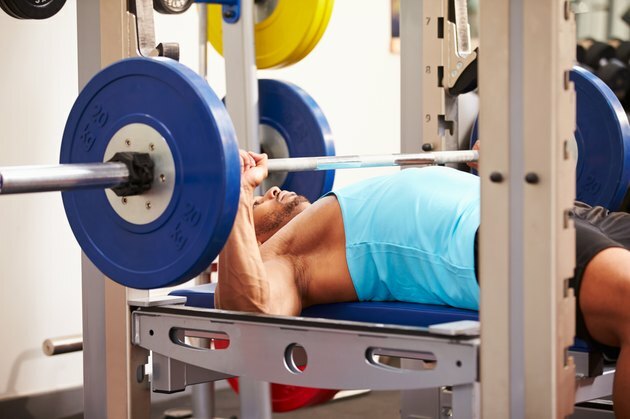 Practicing proper bench pressing technique and regularly strengthening the chest and other secondary muscles used in the bench press can enable you to bench press 100 lb. within two to three months. When an untrained individual begins a new exercise program, his body will go through many adaptations in response to the new stimulus. One of the first systems affected is the neuromuscular system, by which an increased number of motor units are recruited. A motor unit is a single motor neuron and the muscle fibers it supplies. When more motor units become responsive, the result is an increase in strength. Within three to six months, an untrained person may see 25 to 100 percent improvement in strength, according to Jack H. Wilmore and David L. Costill, authors of Physiology of Sport and Exercise. Essentially, if a beginner starts out only able to bench press the barbell weighing 45 lb., by the end of three months she should be able to bench press 100 lb., which is less than a 5-lb. increase in weight lifted each week. Practicing proper bench pressing techniques can help increase your bench press to 100 lb. Lay flat on the bench, keeping your feet flat on the floor and your bottom on the bench throughout the entire movement. Grasp the bar using an overhand grip with hands slightly wider than shoulder-width apart. Squeeze your shoulder blades together causing your back to arch up and your chest to rise up slightly. Position the bar directly over your chest, lower the bar down until it reaches the bottom of your sternum, pause briefly before pressing up to starting position. Do not bounce the bar off your chest and always use a spotter when lifting heavy weights. Practice the proper technique regularly using a moderate weight. Train your chest regularly, but no more than twice a week on non-consecutive days. Keep your training specific to increasing your bench press such as completing three to five sets of two to five repetitions of bench press. Followed by one or two additional chest exercises such as incline bench press and dumbbell press for six to eight reps. Furthermore, following the same programs for months can cause plateaus and injuries. Change your routine or repetition range every four to eight weeks, so your body will continue to have to respond to a new stimulus, which will help increase your strength. The bench press is a compound exercise, meaning it requires the use of additional muscle groups. Weak secondary muscles can prohibit strength gains, especially the triceps and shoulders. Train the triceps and shoulder muscles weekly, paying specific attention to the rotator cuff. The rotator cuff in your shoulder consists of four small muscles used for stabilizing the shoulder during pressing exercises. Strengthening these muscles can reduce injuries in the shoulder and improve your bench press, notes the American Council on Exercise. Furthermore, regularly strengthening your back, biceps, core and legs can help improve your bench press. How Much Can I Increase My Bench Press Each Month?